Urban Impact can scale our recycling services for any business, from a one-time pick-up to a full customized institutional solution. We work with businesses of all shapes and sizes. Choose a business type below to see what your business can recycle and how we can right-size our services to meet your unique requirements. We come to YOU to analyze current recycling practices and get a thorough understanding of your recycling needs, diversion targets and site requirements. If you have multiple recycling needs, we’ll review your waste streams and recommend the most efficient and cost-effective recycling program. We’ll provide the collection and storage bins, signage, and labels and recycling education for your recycling program. This is where your team’s hard work and dedication pays off. At the end of each year, free of charge, we provide a certificate estimating how much waste your organization has diverted. 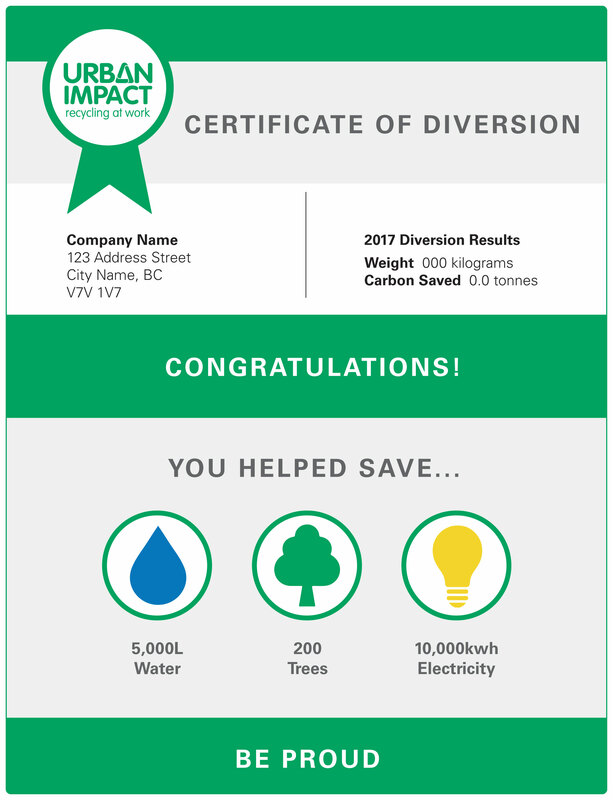 Your Certificate of Diversion shows your recycling progress year-over-year, and sets performance metrics that can be tracked and improved. It also provides water, tree and electricity savings for all paper products recycled and tracks your associated carbon savings. The certificate creates positive messaging to share with your employees and community.